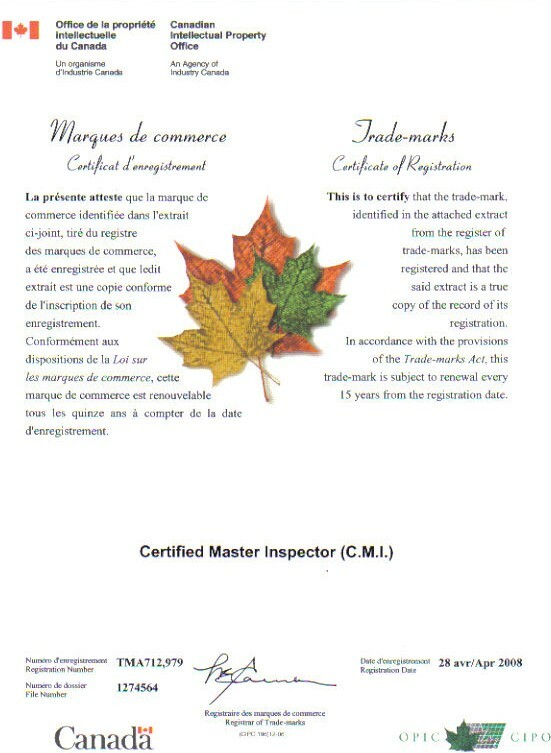 The Canadian Intellectual Property Office (CIPO), an Agency of Industry, Canada, has awarded a trademark for Certified Master Inspector®. The mark is listed under the CIPO index: Residential, commercial and environmental inspection services. The approval process took two-and-a-half years and was facilitated by Certified Master Inspector® Roy Cooke of Ontario. The Master Inspector Certification Board thanks Roy Cooke, CMI®, for his efforts. Certified Master Inspector® is also a Registered U.S. Federal Certification Mark on the Principal Register. CMI® is also a Registered U.S. Federal Certification Mark on the Principal Register. Throughout the world, Certified Master Inspector® is the inspection industry’s top professional designation.